Welcome to Agroventures – New Zealand’s most thrilling adventure playground that boasts not one or two, but FIVE high octane rides that will set your adventurous side alight. 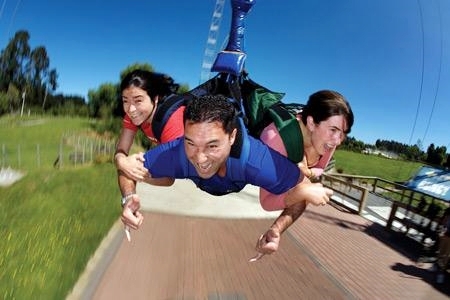 The fun began in 1999 with the opening of the world’s first commercial sprint boat the Agrojet and was closely followed by Rotorua Bungy, the super body swing Swoop, the Southern Hemisphere’s first wind tunnel Freefall Xtreme and finally the one and only Shweeb!…All of which promise to take you to the edge of your limitations. 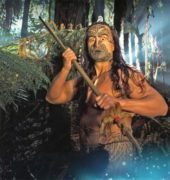 Situated in the idyllic surroundings of Paradise Valley just 10 minutes north of Rotorua and accompanied by a host of wildlife (foreign and native from Buffalo to ostriches), our picturesque park is the perfect setting for family adventures, team building, school trips or even an exotic picnic. 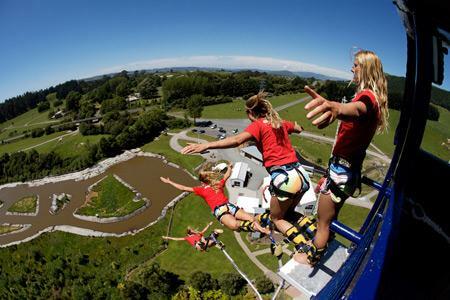 Feel your heart beat as the anticipation increases as your raised 40 meters into the air high above the Ngongotaha stream, and then pulling a ripcord that that plunges you into an exhilarating swoop towards the ground at 130kmph. Take the plunge on your own or get others to join you to make for a more intense experience.